Ryan Jenkins won a hat-trick of golds. Table Tennis Wales carried out a good dry run ahead of hosting the European Veterans Championships in 2021 by successfully staging the Home Nations Vets tournament at the weekend. It proved to be a profitable competition for the Wales national coach Ryan Jenkins as he captured three gold medals on his debut in the Over 40 category. The double British and 12-time Welsh champion beat Andrew Wilkinson 3-0 in the singles final, claimed top spot in the doubles with Ryan Owen and also led Wales to the team title. With the help of Lee Thomas and Neil Wright, Jenkins and Owen were able to break the English stranglehold on the Over 40 title. Lesley Keast won the Over 50 women’s singles title and also struck silver in the doubles with Regina Grech and in the team event. The Welsh women’s Over 40 team of Judith Whitton, Marilyn Morgan and Christina Wright won bronze in the team event, as did the men’s Over 75 team of Dennis Bromage and Roger Thomas. 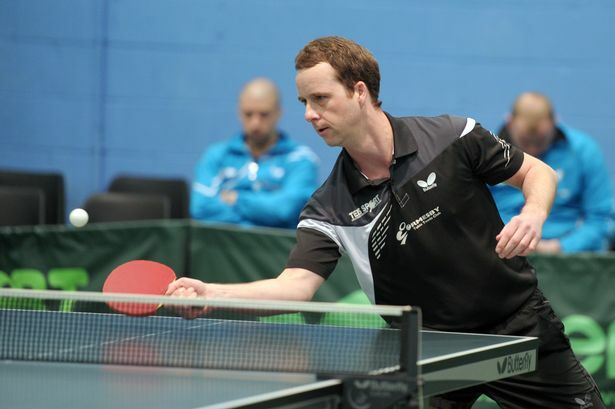 Table Tennis Wales, in partnership with Cardiff Metropolitan University, successfully bid to host the European Veterans Championships in June-July, 2021, earlier this summer, beating off strong competition from Spain and Norway. With around 3,000 competitors due to head to the Welsh capital it will be the biggest Table Tennis event ever hosted Wales. The next Home Nations Vets tournament will be staged in Perth, Scotland, next year.